The character and elegance of a hardwood floor makes it a favorite among homeowners. And if you’ve come here you’re probably more than just mildly interested in hardwood. The point of this section is that, if you’re seriously considering hardwood floor covering as a solution for the way you live, the way you treat that floor is important. 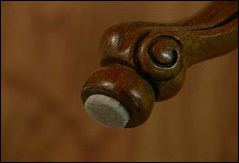 Wood is a natural, beautiful and timeless design and decorating element. Caring, consistent and correct maintenance will insure it remains that way. Frankly, we believe you wouldn’t have it any other way. So check out the hardwood floor care tips below and be prepared to have your family and friends “check out” your new hardwood floor with praise. For years to come. 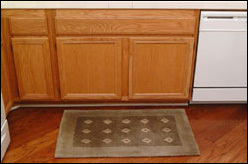 n addition to entryways, remember to place mats in any areas where water may be splashed, such as near a kitchen sink. 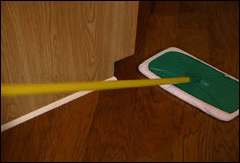 For "finish in place" hardwood floors, we recommend using an 8”x14” terrycloth mop with a rotating head that makes cleaning corners, under cabinets and along base boards an easy task. Spray a professional wood floor cleaning product recommended by your retailer to safely remove tough stains and spills without dulling the finish of your floor. Manufacturers of "pre-finished" hardwood floors recommend their own specific products designed for their floors routine maintenance. Be sure to check with your retailer as well about these cleaners. Beyond surface cleaning: deeper methods. This should only be done if a screening and recoating does not solve the problem. This is an extensive process where the floor is sanded down to the bare wood, restained and then refinished. If the damage is only in a small area you may want to see if replacement boards are available to alleviate having to refinish an entire area. Finally, protect against Father Time, Mother Nature and active families. Stiletto heels can cause dents and scratches that are not covered by your warranty. Love your pet but regularly trim their nails or claws to avoid scratches on the hardwood floor. The point here is to be cautious of sharp objects that may scratch or damage the floor. Tread carefully! Hardwood floors can bring warm beauty to your home. They are very durable, but you have to take proper care of them to make it long-lasting. Here, the information you have provided in your blog helps the viewers and provide them the most effective ways to clean their hardwood floor. Always take necessary steps to prevent the dirt and damage from your floor and avoid the scratches arises in your floor. 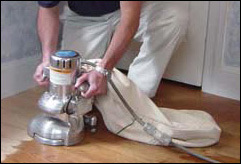 Put rugs in high-traffic areas of your home by using floor protector under the furniture and heavy lift equipments. You can also clean your hardwood floors by using water mixed with a sub-producing soap, such as dishwashing liquid or a mild laundry detergent.